Well, I usually… I usually try to put in songs which are different in their own context, either structurally or melodically or uh lyrically, that uh, don’t… so it’s not all the same type of material, I try to fill in a larger picture. I don’t know what the total effect of it is. Umm… How do I go about selecting the material? Well, there’s material that I WANT to play, there’s material that I feel I HAVE to play, and, uh, I try to get the material that I feel I have to play into the frame of mind where I want to play the material that I have to play. The rest of it is just stuff I want to play. 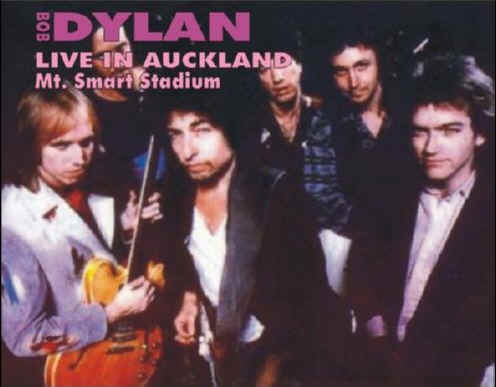 The tour started with two concerts in New Zealand and thirteen concerts in Australia before four concerts in Japan. 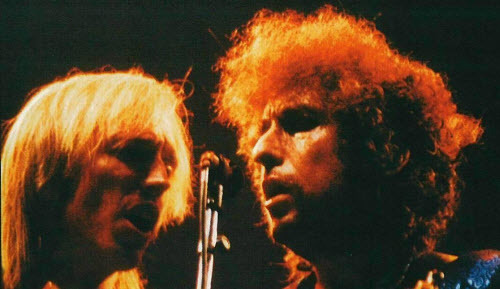 Both Dylan and Petty took a break after this tour before returning to the road in June to perform a forty-one date tour of the United States and Canada. During the tour the pair performed two concerts at the RFK Stadium in Washington, DC, three concerts at the legendary Madison Square Garden in New York City and two concerts at The Spectrum in Philadelphia. The tour came to a close on August 6 in Paso Robles, California. The pair would tour together the following year on the Temples in Flames Tour. Rehearsals (w/Tom Petty & The Heartbreakers) took place in December 1985. Oh no, no, I can’t do that, because my songs speak for that. I usually say everything I have to say through the songs. I mean it would be pointless for me to go out and say how I feel about this and how I feel about that. I could never articulate this well. The general observation is that the shows gradually became better.. similar to the 78-tour. 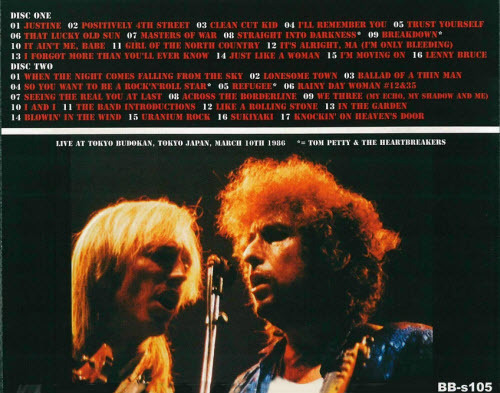 Dylan’s setlist, which stayed fairly constant throughout the 61 “True Confessions” gigs, was significantly different from 1984: typically only 8-10 ‘Greatest Hits’ out of 24 or 26 songs. The other songs included 4 or 5 from ‘Empire Burlesque’, 4 or 5 from Dylan’s other recent albums (1980-83), and 6 or 7 covers, most of them rockabilly or country or country/pop. All in all, a nice recording of a great show. Here is a bunch of GREAT audio clips.. The Queens Of Rhythm: Debra Byrd, Queen Esther Marrow, Madelyn Quebec, Elisecia Wright (backing vocals). Part 3 of this series will deal with the “US Summer Tour” leg of the tour. 1 Channeling God’s word: When someone has artistically gifted as Dylan asks himself “Why me?” probably the only answer that makes sense is that he is in touch with the transcendental however you might want to interpret that (take your choices: Emerson, Whitman, Blake, St. Augustine ….). 2 Simplicity: While the lyrics to a Dylan song may well be complex, the images evoked are very concrete and the mechanics of the song (melody, rhythm, instrumental texture) generally simple and driving. 4 Skepticism about progress: Radio when you had to use your imagination was probably better than video. Dylan has always been ambivalent about “progress” whether it be technological or political or social. 5 Its all about Roots: Whether blues, jazz, Gospel, rock and roll, folk he’s all about the artistic integrity of American roots music. He’s an American artist, channeling a great tradition (whether it be the Highway 61 of the blues, Gospel arising out of the Black churches, folk and country coming out of bluegrass, the old travelling medicine shows, you name it). Quite an amazing and essential website for us Dylan fans I must say! Another fine article, many thanks. I hadn’t heard the Nippon Budokan Hall stuff, and you are right, it’s fantastic, probably the most “together” they sounded on the whole tour for me. BTW, I once heard Dylan’s London performance from ’87 I think it was, the night of the London hurricane, and it was an amazing performance. I saw him the next night, on the Saturday. any chance of posting some of the stuff from that Friday gig, if you have access to it? The Budokan 86 is a great concert… IMO. We’ve got stuff from London 87.. but that’s another tour… and posts I’m looking forward to create. The “Temple in Flames Tour” is essential stuff. I enjoy your posts very much. Thank you. 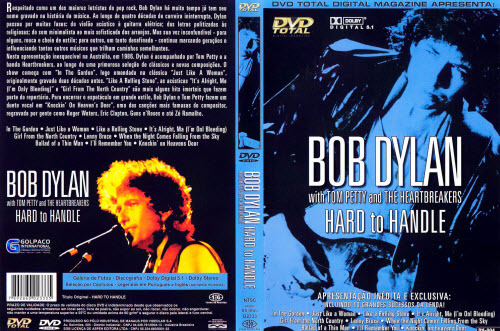 why did ‘Hard To Handle’ never get released on dvd ? I don’t know… There’s loads of stuff in “Sony’s vaults” which needs to be released!